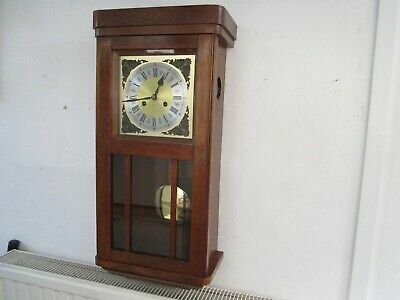 Antique Jungans Light Oak Wall Clock In Very Good Working Order. Seller: 951942 (661) 100%, Location: Carnforth, Ships to: GB & many other countries, Item: 333123537341 THIS IS A SUPER CHIMING JUNGANS WALL CLOCK WHICH COMES WITH ITS PENDULUM AND KEY. IT HAS AN UNUSUAL CHIME WHICH IS VERY NICE. THE CASE HAS A FEW AGE RELATED MARKS, BUT DOES NOT DETRACT FROM THE APPEARANCE. IT STRIKES ON FOUR CHIMING BARS AND HAS TWO GLASS INSPECTION PORTS. THE CLOCK HAS A DEEP RICH PATINA. THE GLASS ON THE DOOR IS UNMARKED. THE CLOCK KEEPS VERY GOOD TIME, STRIKES ON THE HALF AND COUNTS THE HOURS. A GREAT ART DECO CLOCK WHICH MEASURES 71 CMS TALL BY 32.5 CMS ACROSS AND 17 CMS DEEP. THE POSTAGE IS TO U.K. ONLY (INCLUDING THE INTERNATIONAL SHIPPING DEPOT IN THE U.K.). THANK YOU FOR LOOKING. REGARDS PETER. Popularity - 39 views, 1.0 views per day, 38 days on eBay. High amount of views. 0 sold, 1 available. 39 views, 1.0 views per day, 38 days on eBay. High amount of views. 0 sold, 1 available. Seller - 661+ items sold. 0% negative feedback. Great seller with very good positive feedback and over 50 ratings. 661+ items sold. 0% negative feedback. Great seller with very good positive feedback and over 50 ratings.